Setting up the collection of sales tax in Georgia is easy. Log into your Shopify Store and go to Settings –> Locations. You can easily add a new location by clicking the “Add Location” button. You will want to make sure our office is set as a location with the following address. Next go to Settings –> Taxes. In the Tax Rates section click the United States option. 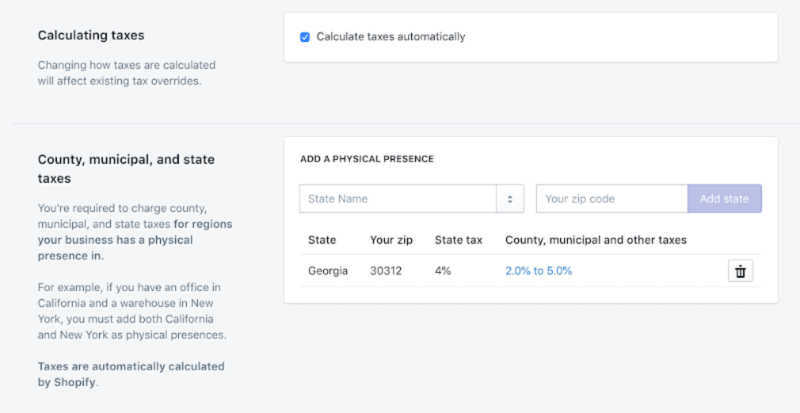 Make sure you have Georgia selected and your Tax Settings should look like the photo below. If you would like to become Tax Exempt in Georgia please follow this article.